How many people should you play Torchlight 2 with? About four - but that might not stop developer Runic from letting you play with more. I absolutely loved 2009's indie hit Torchlight, but that didn't mean that it was without flaws - most glaring among them a lack of multiplayer support, which seemed practically unforgivable in a game that pulled off the Diablo formula so well. Torchlight II, however, seems to be fixing many of those flaws, including the lack of multiplayer. Runic boss Max Schafer - one of the original developers of Diablo at Blizzard North - spoke with VG247 and laid everything out about the upcoming Torchlight sequel. 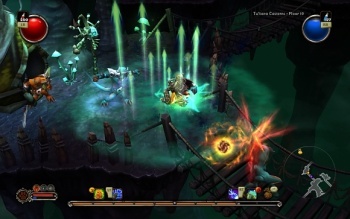 Schafer touched on issues like the growing place of small-scale, small-budget games in today's blockbuster-driven market, and discussed just what had made Torchlight such a hit among gamers. He also discussed the multiplayer in the upcoming sequel, saying that while the game had a "sweet spot" of four characters playing together at once, Runic might let players double that anyway. It's entirely soloable, so you can play as one person. We haven't set the party maximum just yet. The sweet spot, just from playing in the office, is 1-4 players. There's no technological reason why we can't increase that, but once you get up to, like, eight players, it gets ridiculously crowded if you're at all in the same area. It is possible to have a group of four in the late game and then another group of four in the early game in, technically, the same game session and you just never see [each other]. It works fine. It's an ongoing debate right now where we set the maximum number of players in the game. It'll probably be between four and eight. Incidentally, this was the same conclusion reached by the Diablo III team: When you have more than four players in a game, they just aren't playing together. Or if they are, they're trying to kill each other - Schafer said that the team would enable an optional PVP mode, but that they wouldn't try to balance it: It was just about trying to beat up your friends. The full interview with Max Schafer is a fantastic read, and you can check it out over at VG247.